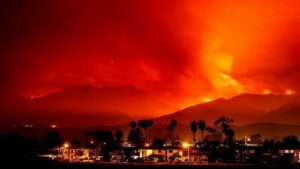 California’s Insurance Commissioner, Dave Jones, has announced that insured losses from the October, 2017 California wildfires now exceeds $3.3 billion, which includes damages to residential and commercial properties, personal and commercial autos, watercraft, and farming equipment. The latest insured loss estimate utilises loss data from 15 insurers, and includes partial losses to 10,016 residential properties, total losses to 4,712 residential properties, 728 commercial property losses (which includes commercial businesses and multi-family (apartments) with four or more units), more than 3,200 personal auto losses, 91 commercial auto losses, 153 farm or agriculture equipment losses, and 111 watercraft losses. The latest $3.3 billion insured loss figure is a three-fold increase on the previous estimate, in just two weeks, and is expected to increase further in the coming weeks as claims continue to come in. Catastrophe risk modeller, RMS, said recently that insured losses from the wildfires, that started at the beginning of October, would range between $6 billion and $8 billion, although this range excludes losses to agricultural crops and automobiles. The latest report cites that more than 14,700 homes have been either damaged or destroyed, 728 businesses, and over 3,600 automobiles, commercial vehicles, watercraft, and agriculture equipment. RMS’ recent estimate for the event was based on 8,400 structures being either destroyed or damaged, and with the latest data from the California Department of Forestry and Fire Protection (CAL Fire) revealing that 8,900 structures have now been destroyed, combined with the fact RMS’ data excludes auto and agriculture losses, it’s very possible that the RMS insured loss estimate could increase. Breaking the losses down, and the California Department for Insurance shows that residential properties make up the most of the loss, accounting for roughly $3.15 billion, or around 95% of the current, overall loss. Commercial property losses make up roughly 4%, or $136.8 million of the loss, with the remaining 1%, or $33.7 million coming from a combination of personal and commercial autos, watercraft and agriculture equipment losses.